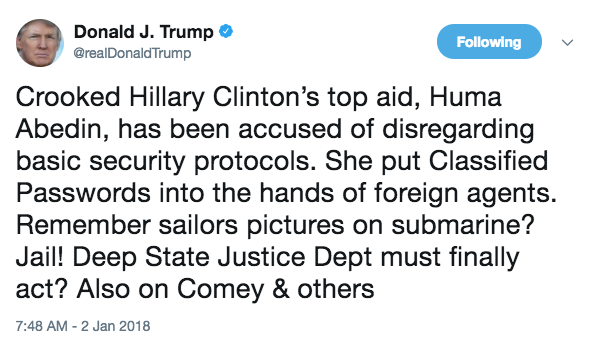 President Donald Trump on Tuesday tweeted that former Secretary of State Hillary Clinton’s longtime top aide should face jail time for releasing classified information and breaching national security protocols. This after it has been learned that Huma Abedin forwarded State Department emails – including at least four classified emails – to her personal email account and her husband’s email account, for him to print out. Trump also called on the “deep state” Justice Department to act. The former Navy sailor Trump referred to is Kristian Saucier, who served a prison sentence and is now under house arrest for taking unauthorized photos inside the USS Alexandria. Saucier pleaded guilty to the charges last year for releasing unauthorized Department of Defense information by taking photos of the Alexandria when it was in Groton, Connecticut, in 2009. The State Department recently released a batch of Abedin’s emails that had been forwarded to her now-estranged husband, Anthony Weiner. The FBI found the emails on Weiner’s laptop, and at least four of them were labeled “classified.” The emails had been forwarded toward the end of the 2016 Presidential campaign. The Daily Caller had the exclusive on Monday about Abedin’s Yahoo email forwarding scandal. “She would use these accounts if her (State) account was down or if she needed to print an email or document. Abedin further explained that it was difficult to print from the DoS [State Department] system so she routinely forwarded emails to her non-DoS accounts so she could more easily print,” an FBI report says, The Daily Caller reported. Former FBI Director James Comey has backed up this statement, and said during a congressional hearing that Abedin regularly forwarded such emails to her husband for him to print out. Hillary Clinton has come under fire for her carless handling of classified emails on a private email server, and the topic was a huge talking point during the 2016 Presidential election. A U.S. District Court judge in August ordered that the State Department re-open its investigation into Clinton’s emails, and to search for anything written about the Benghazi attack in 2012 that might be contained on the State Department’s email server, state.gov.